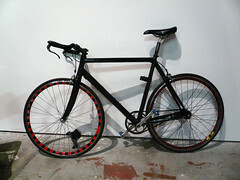 BrightBike from Michael Mandiberg on Vimeo. Bright Bike at Holiday Hackshop. from Michael Mandiberg on Vimeo. Right now we are in the prototyping stages, and hope to offer a DIY Kit soon. We just held a bike-wrapping workshop at Eyebeam's Holiday Hackshop (you can see the video at left) and it was a lot of fun. We also released an instructable, making it clear how anyone can wrap there bike. 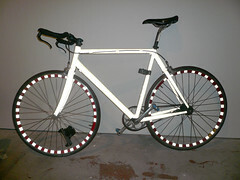 Check it out: Bright Bike Instructable. 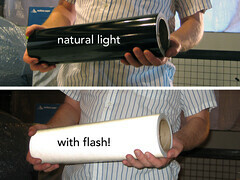 If you can't wait that long, contact Beacon Graphics in NJ for Scotchlight 680. They have a website: BeaconGraphics.com and you can also reach them by phone: 1 800 762 9205.